Hungry dogs sometimes due to high excitement can spill out food and water from the bowls, which can make your house dirty. There comes a need where you want to feed dogs without bothering about the spilling. We at PetsWorld offer you Basecamp Mats which prevents the food and water bowls from tipping off. The Place Mats we offer is a perfect place for your pet dog to refuel and rehydrate. The mats are also waterproof and easy to pack which will enable you to take it along during camps and picnic. It is formulated with a high-quality polyester fabric having a very high durability. They are also air dry, which help the mats to quickly dry up. The placemats prove very beneficial during camping and trips where the food bowls of your pet can tip-off. 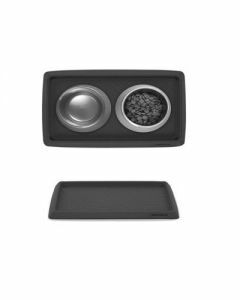 The Mats fits the food and water bowls so perfectly which support a hassle-free feeding of your pet dog.